During the week of June 5, coinciding with our two millionth flag celebration, Phoenix was honored to have three out-of-state staff members visit for various trainings, meet with government customers and joining in on our flag celebration ceremony. Sherry Florian is our Project Lead for Missile Defense Agency’s mailroom at Schriever Air Force Base in Colorado Springs, CO; Pete Newman is our Project Manager and Andre Phillips is our Assistant Project Manager for Missile Defense Agency’s custodial and mailrooms at both Ft. Belvoir, Virginia and Dahlgren Naval Base, Virginia. Although Pete had been at Phoenix’s corporate offices before, this was Sherry’s and Andre’s first visit. They spent two days training with accounting, payroll, human resources, employee support services and vocational rehabilitation services in order to better support our employees at their respective locations, as well as our Missile Defense Agency customer. They were able to tour our facilities on Johnson Road, visit various locations at Redstone Arsenal, and meet several key staff members during their visit. 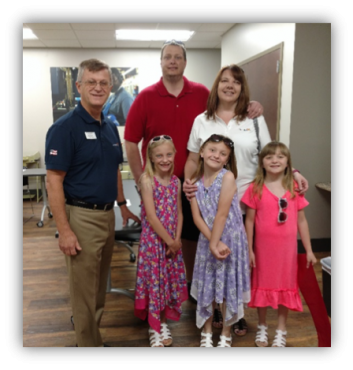 Andre expressed, “I had no idea how big Phoenix really is and what all we do.” Below is a photo of Sherry, her husband Chris and daughters Taylor, Kaitlyn and Leigha, during their tour of the corporate offices, provided by Vice President of Government Services, Tim Stickley.